Join StayPoints! It's free and easy. Get rewarded for smart travel today. Earn StayPoints for your stay and redeem your points for millions of merchandise items, airline tickets, worldwide events, and so much more! We find or have reason to believe that your actions on our website violate website terms or conditions or are in violation of the law. Demographic and Supplier Profile Information. Demographic information may be collected at this website from time to time through surveys or other methods. We also collect general information about users of this website, such as which areas of the website and which services users utilize most frequently. We use this information in aggregate form to assess the functionality and performance of this website and to assess the needs of our suppliers. This information may be shared with third parties on an aggregate basis. Internet Protocol Address. We may collect an IP address from all visitors to this website. We may use your IP address to help diagnose problems with our server and to administer this website. Your IP address may also be used to help identify you when you visit this website. Other. We may disclose information about you and your use of this website if required to do so by law, court order, or other government or law enforcement authority; or when we believe in good faith that disclosing such information is otherwise necessary or advisable, including, for instance, to satisfy tax and other reporting purposes or to identify, contact or bring legal action against someone who may be causing injury to or interfering with the rights or property of LW, Sponsor, another user, or of anyone else that could be harmed by such activities. 1. You acknowledge that StayPoints, LLC has contracted with Marketing Partners and Property Operators in connection with the administration and operation of the Program. 2. 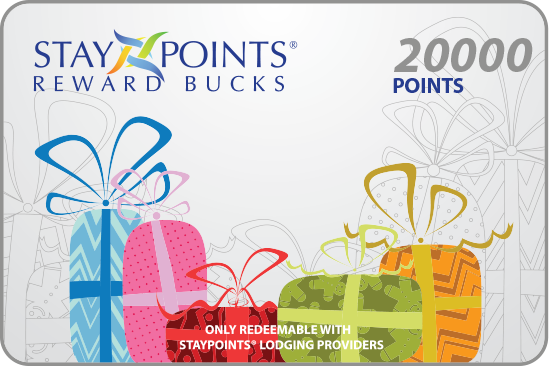 STAYPOINTS, LLC PROVIDES THE PROGRAM, THESE AND OTHER MATERIALS, THE CONTENT, AND ALL OTHER SERVICES, REWARDS, AND PRODUCTS "AS-IS" AND, TO THE FULLEST EXTENT PERMITTED BY APPLICABLE LAW, EXPRESSLY DISCLAIMS ANY WARRANTIES OF ANY KIND, EXPRESS OR IMPLIED, INCLUDING BUT NOT LIMITED TO, WARRANTIES OF MERCHANTABILITY, FITNESS FOR A PARTICULAR PURPOSE, DESIGN, ACCURACY, CAPABILITY, SUFFICIENCY, SUITABILITY, CAPACITY, COMPLETENESS OR AVAILABILITY. You also agree that StayPoints, LLC, its Marketing Partners and Property Operators do not represent, warrant or guaranty that the Program, Content, or any such other products, Rewards, and services will be uninterrupted, without omissions or error-free, or that defects will be corrected or changes implemented. IN NO EVENT SHALL STAYPOINTS, LLC, ITS MARKETING PARTNERS OR PROPERTY OPERATORS BE LIABLE TO YOU FOR ANY DIRECT, INDIRECT, INCIDENTAL, SPECIAL, PUNITIVE, OR CONSEQUENTIAL DAMAGES WHATSOEVER RESULTING FROM OR RELATING TO (I) YOUR PARTICIPATION IN THE PROGRAM, (II) ANY ERRORS, MISTAKES, OR INACCURACIES OF CONTENT, (III) PERSONAL INJURY OR PROPERTY DAMAGE, OF ANY NATURE WHATSOEVER, RESULTING FROM YOUR PARTICIPATION IN THE PROGRAM OR USE OF ANY REWARDS, (IV) ANY UNAUTHORIZED ACCESS TO OR USE OF OUR SERVERS AND/OR ANY AND ALL PERSONAL INFORMATION AND/OR FINANCIAL INFORMATION STORED THEREIN, (V) ANY INTERRUPTION OR CESSATION OF TRANSMISSION TO OR FROM OUR WEBSITE, (VI) ANY BUGS, VIRUSES, TROJAN HORSES, OR THE LIKE, WHICH MAY BE TRANSMITTED TO OR THROUGH OUR WEBSITE BY ANY THIRD PARTY, OR (VII) THE STAYPOINTS, LLC WEBSITE OR ANY USE THEREOF, WHETHER BASED ON WARRANTY, CONTRACT, TORT, INDEMNITY OR ANY OTHER LEGAL THEORY, AND WHETHER OR NOT STAYPOINTS, LLC IS ADVISED OF THE POSSIBILITY OF SUCH DAMAGES. THE FOREGOING LIMITATION OF LIABILITY SHALL APPLY TO THE FULLEST EXTENT PERMITTED BY LAW IN THE APPLICABLE JURISDICTION. Some jurisdictions do not allow the exclusion or limitation of incidental or consequential damages, therefore such exclusions may not apply to you. In the event StayPoints, LLC, its Marketing Partners or Property Operators is held liable for any damages related to such matters, your sole, and exclusive remedy will be limited to a one time payment equal to the lesser of (i) the value of accrued Points in your membership account, or (ii) five hundred dollars ($500.00). You hereby waive any and all rights to bring any claim or action related to such matters in any forum beyond one (1) year after the first occurrence of the kind of act, event, condition or omission upon which the claim or action is based, otherwise such claim or action is permanently barred. If any provision(s) of these Terms and Conditions are held to be invalid or unenforceable, all remaining provisions hereof will remain in full force and effect. The failure by StayPoints, LLC to exercise rights granted to StayPoints, LLC hereunder upon the occurrence of any of the contingencies set forth in this agreement will not constitute a waiver of such rights upon the recurrence of such contingency. 3. You agree to defend, indemnify and hold harmless StayPoints, LLC, its Marketing Partners and Property Operators from and against any and all claims, damages, obligations, losses, liabilities, costs or debt, and expenses (including but not limited to attorney's fees) arising from: (i) your enrollment, use and participation in the Program; (ii) your use of any Reward, (iii) your stay at any StayPoints Property or non-participating property, (iv) your breach or violation of any term of these Terms and Conditions; or (v) your violation of any third party right, including without limitation any copyright, trademark, property, or privacy right. This holds harmless defense and indemnification obligation will survive these Terms and Conditions and your participation in the Program. We've made redeeming points with affiliated lodging providers easy. Participating providers will accept Reward Bucks for stays, amenities and so much more! Check with your provider before purchasing Reward Bucks.